“Draft wine” is wine that has been kegged and then served from the tap instead of the bottle. There are a few benefits to using wine kegs for home storage and consumption. 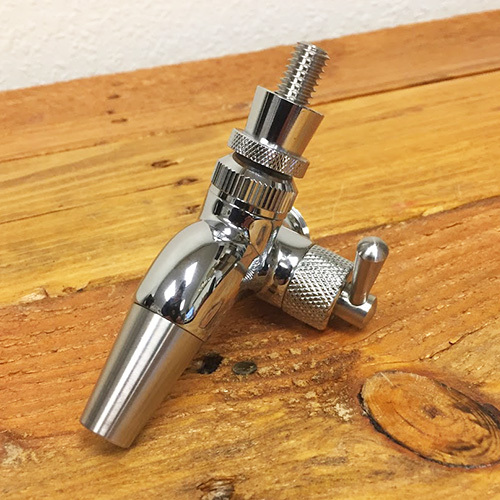 Learn how to setup an efficient wine tap system for home use and discover the benefits of draft wine for yourself! You’ve probably heard of kegerators and keezers, but what about winerators and weezers? Why do brewers get to have all the fun? All joking aside, there is a bit of truth to these questions. If beer can be kegged, why not wine? Every year, more and more wineries and restaurants are seeing the benefits of kegging their wines and serving them on draft systems. Either served “still” or “carbonated/sparkling”, draft wine is available for a minimal investment. “Draft wine” is wine that has been kegged and then served from the tap instead of the bottle. There are a few benefits to choosing draft wine over bottling. It saves a lot of time. Instead of filling many bottles, you just fill a keg. I rarely finish a bottle of wine in one sitting so I like that I can pour myself how much wine I want to drink. One of my favorite things about draft wine is that it allows you to easily make various wine blends without committing all the wine to the cause. With draft wine I can blend in a pitcher or in the glass itself. You don’t have to give up bottling entirely. Unless the wine is carbonated, you can quickly fill a wine bottle right off of the tap and use a corker to pop in a cork. This way you can still take bottles with you or share them with friends. There isn’t a whole lot of equipment necessary to set up a basic draft system. I like to split draft systems into two sides: the gas side and the beverage side. 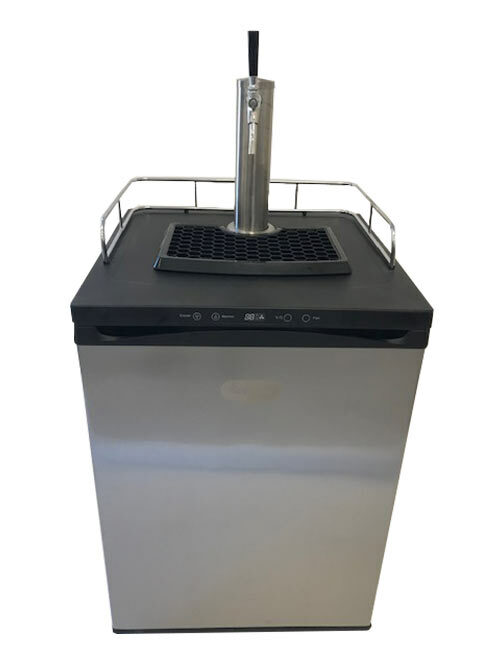 Here at The Beverage People, we have everything you need to set up a Carbon Dioxide (CO2) draft system as well as a Nitrogen draft system, or Argon draft system if you so desire. 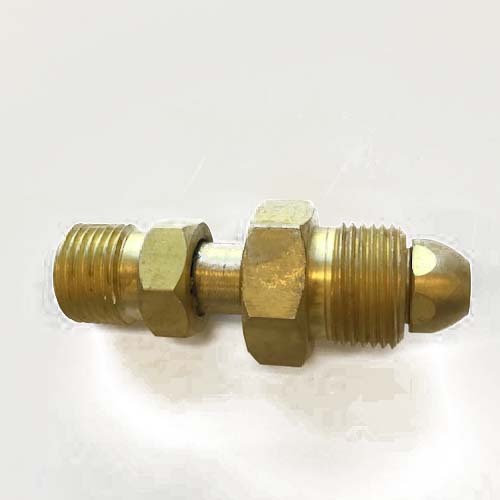 Regulator (gas specific; be sure to get the proper regulator for your tank), and potentially a tank adapter. 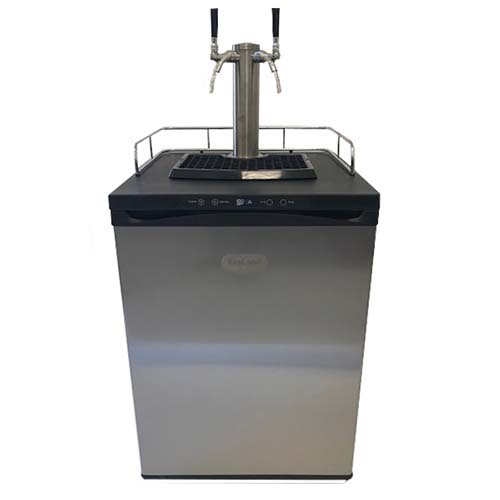 Complete Used Wine Keg Systems are available that may be placed into an extra refrigerator, or you can purchase a complete wine kegerator. The bulk of the investment in a draft wine system will be the gas tank and regulator. The most important factor to consider when choosing a gas is deciding whether or not you want your wine sparkling. For still wines, argon or nitrogen are better choices, as they are much less soluble into the wine than CO2. Unfortunately, CO2 will always carbonate the wine at least a little, even at room temperature. For sparkling wines, CO2 is the right approach. 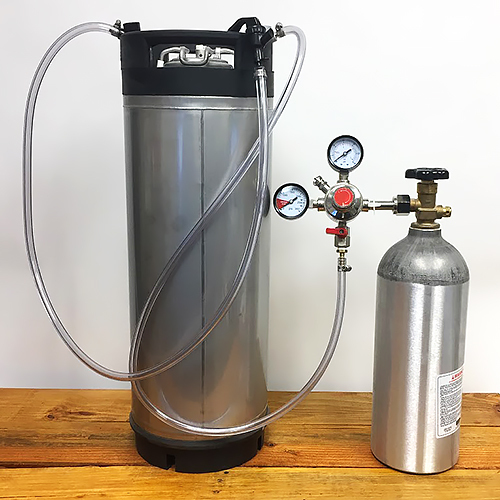 If you want the ability to do both still and sparkling wines but only want to own one gas, I would recommend a CO2-based keg system. It’s simple, not too expensive, and works well for still and sparkling wines. You will just have to accept that your still wines may be slightly pétillant. If you are not interested in sparkling wines, a nitrogen-based keg system will keep your reds, whites, and rosé wines preserved and pouring without carbonation at whatever temperature you desire. Argon is very similar to nitrogen in behavior, but it is a much heavier gas. It is also more expensive than nitrogen. It is very useful for displacing air space in tanks before filling them, but generally not necessary simply for keg service. If you review carefully the comparative weights of the gases above, you 'll note that Nitrogen is lighter than air, while both Argon and Carbon Dioxide are heavier than air. All three of them are inert noble gases, meaning they are not reactive with your beverage. 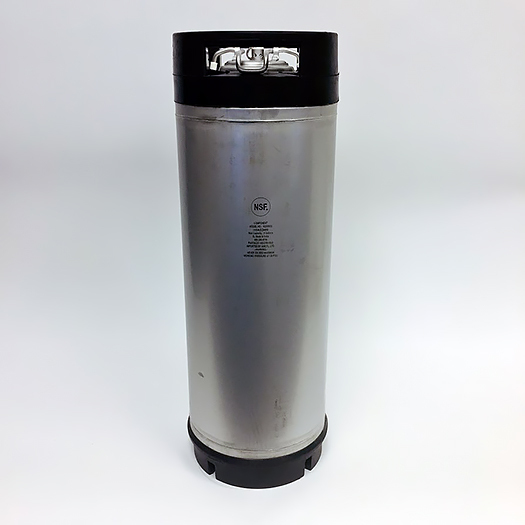 The heavy weight of Argon and Carbon Dioxide can be a great advantage for filling tanks and kegs because it can be used to displace air before they are filled, ensuring your beverage is not exposed to oxygen during transfer. Argon is the most expensive of these gases, however, so if you choose to work with it be sure you are not wasteful and that you have pressure tested the whole system to avoid leaks. You can think of the keg as one big wine bottle. Start with a cleaned and sanitized keg and siphon the wine into it. Once the keg is filled, place the lid back onto the keg. Now it’s time to purge the headspace of the keg. We need to displace and purge out the oxygen in that headspace with our gas of choice. Connect the gas side disconnect to the keg and turn the gas on. I usually have my regulator set to about 10 PSI when I do this. You will hear gas hiss into the keg. 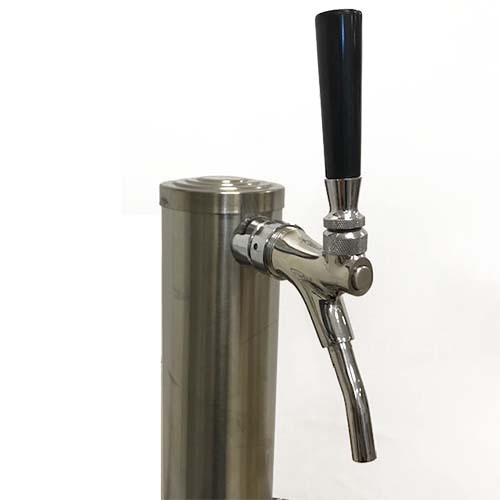 When it stops, turn off the gas and pull the pressure release valve on the keg. The keg will vent out gas for a few moments and stop. You will want to repeat this process between three and six times. When you are finished purging, make sure you allow gas into the keg one last time to blanket the wine. If you are worried about picking up oxidation while you siphon into the keg, make sure your wine has been properly sulfited and give the headspace of the keg a few extra purges for good measure.Now you are ready to serve your wine, carbonate it to turn it into sparkling wine, or just store it. We keep our white and rosé wines in the kegerator/winerator and the red wines out. This allows us to focus on keeping our white and rosé wines chilled. If your winerator can hold temperatures of 50-55 degrees F, that would be an ideal choice for your reds. If that's not an option with your setup and the red wine gets a little warmer than we want to drink it, we just put a pitcher of wine in the refrigerator until it cools to a more desirable temperature. For sparkling wines, there’s an additional step of forcing gas into solution to make the wine sparkling and bubbly. To force gas into solution, the wine has to be cold. To keep the wine cold, you need a refrigerator or a freezer. The procedure to make sparkling wines is the same regardless of the color and type of the wine. Once the wine is in the keg and the keg has been purged, the keg must be chilled. Store the keg for a day in the fridge. With the wine cold, now you can shake the keg to start forcing gas into solution. Another way to start forcing gas into solution is to roll the keg on its side on the ground for a while. I usually shake the keg until I get tired, so usually just a few minutes. Then put the keg back into the refrigerator and leave it hooked up to the gas with the gas open until it is carbonated to your taste, usually 3 days for minimal carbonation and up to three weeks to reach sparkling wine bubbles. 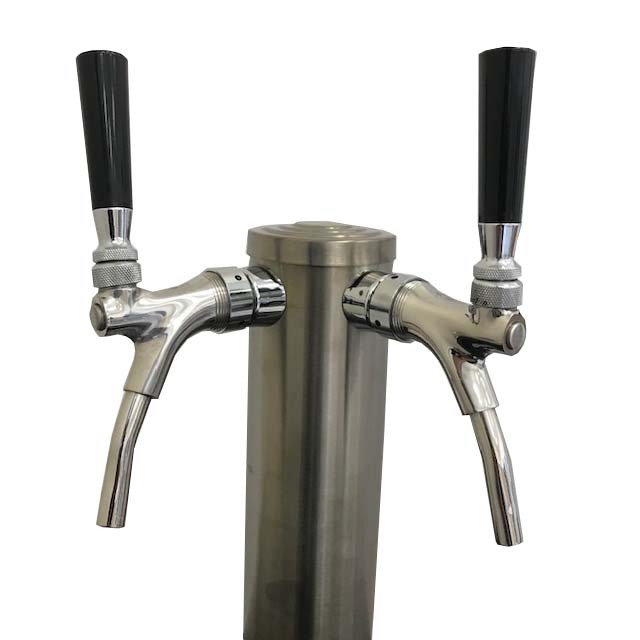 When it comes to carbonating and then serving a keg there are a few factors: temperature, pressure (PSI), volumes of CO2 and resistance. Balancing these factors can be tricky, but once you get a basic understanding of how all these factors influence each other, it’s not too bad. Temperature and pressure both influence how many volumes of CO2 you can drive into the wine. You want to carbonate to a desired volume of CO2 in the wine. This is in part driven by taste. Once you know how many volumes you are aiming for, you can decide on a serving temperature and then adjust the PSI on the regulator to get the desired volumes at that temperature. Then just adjust your serving line length to provide enough resistance to negate that pressure and serve smoothly without any foaming. I’m not going to get into the nitty gritty of that in this article, but anyone at The Beverage People can help you determine this. Champagne or sparkling wines are typically carbonated to about 6 volumes of CO2. Beers on the other hand are commonly carbonated to about 2.5 volumes. Use these numbers as reference points when thinking about what kind of carbonation you are looking for in your own wine. For a champagne-like carbonation, at 40°F you will need about 50 PSI to get about 6 volumes of CO2 into solution. To get a basic understanding of the relationship between pressure, temperature, and carbonation level, take a look at this Carbonation Chart from Glacier Tanks. 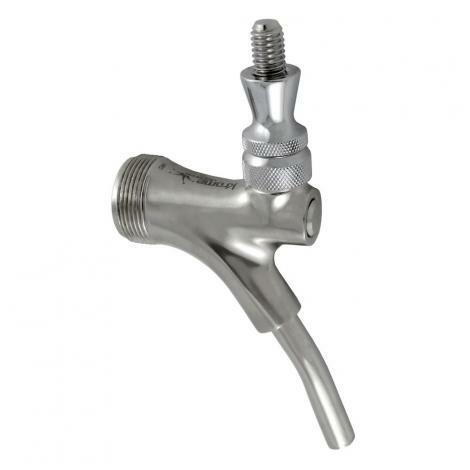 Most CO2 regulators bought for homebrew systems have low pressure gauges that only go up to 30 PSI. Not a problem. 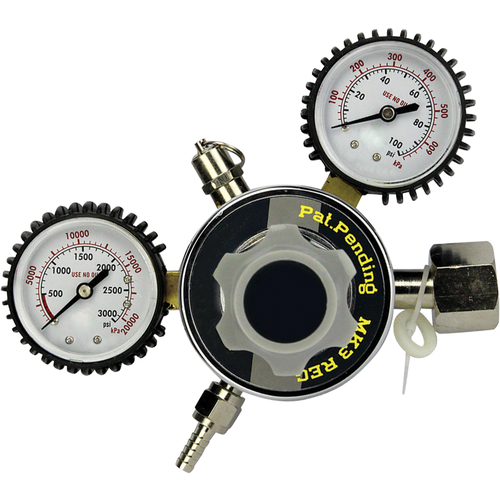 The Beverage People carry replacement gauges that are 0-60 PSI, and are easily swapped out for the 0-30 PSI gauges. For beer-like carbonation, at 40°F you will only need about 12 PSI. For pétillant wines, just use whatever pressure you need to push the wine. With CO2 on the wine, it will pick up a small amount of carbonation slowly. All in all, draft wine is a great idea for home winemakers. It saves time and money. It keeps the wine fresher longer. It limits the amount of wasted wine. And it gives you some more options in terms of things you can do to your wine (still, sparkling, or somewhere in between, sweet or dry, etc.). I would recommend giving it a try. Remember, you can still fill bottles off the faucet and cork them as you need them!